Join Dusty and his friends from Disney Planes: Fire and Rescue for exciting new adventures! The forest is on fire and Dusty, Blade Ranger and Drip must do everything they can to put it out. Fill up at the water station, then help Dusty and Blade extinguish the flames with the water bricks. Your child will love creating endless action-packed role play with this easy-to-build LEGO® DUPLO® set featuring familiar characters from the Disney Planes: Fire and Rescue animated movie. Last known price is 36% above the initial Lego retail price! The Fire and Rescue Team (10538) Lego set is no longer directly available from the sites below. However, 3rd party partners of these sites might still have the set available. 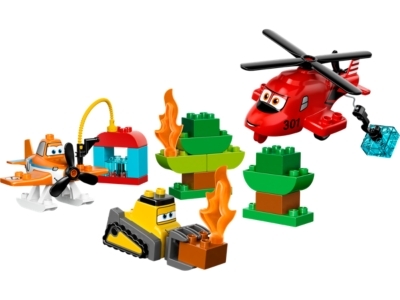 Alternate description Stop the forest fire with the Fire and Rescue Team LEGO® DUPLO® brand Planes™ set with Dusty, Blade Ranger, Drip, water station and more.